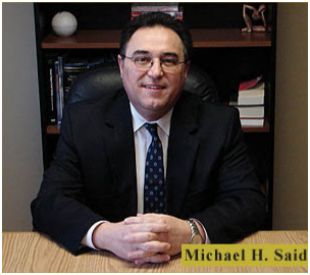 About Us – Law Offices of Michael H. Said, P.C. Michael H. Said, J.D., LL.M. -The American University, Washington, D. C. Master of Laws in International Business -Transactions, 1990 Received American Jurisprudence Award for top performance in Law of the Sea and Negotiation Seminar. -Walter F. George School of Law, Mercer University, Macon, Georgia Juris Doctor, 1989 -Captain of International Law Moot Court Team. President of International Law Association. -Selected for Who’s Who in American Colleges and Universities. -President of International Students Association. Selected to Delta Sigma Pi, International Business Fraternity.